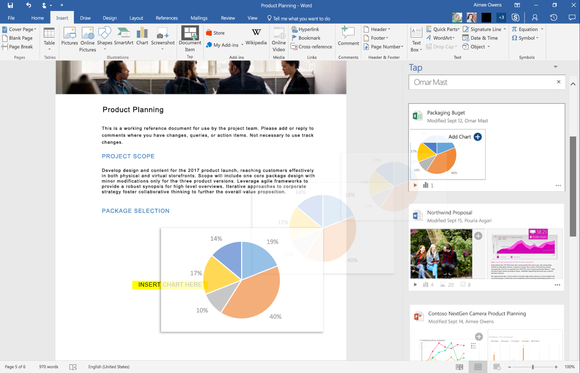 Microsoft is going big on features powered by machine learning in its productivity services, with the announcement of a handful of updates to Office 365 on Monday. As part of its Ignite conference in Atlanta, Georgia, the company unveiled a set of new capabilities for Word, Outlook, PowerPoint, Excel and Sway. Microsoft faces tight competition in the productivity space, and these services may help the company compete with Google for market share among businesses. Microsoft Word's Tap feature makes it easier for users to bring information from other Office files into a document. A new Tap feature in Word and Outlook makes it easier for people to pull information from relevant files around their organization into an email or document that they're writing. For example, it might suggest that users add content from Excel or PowerPoint into an email. It's aimed at helping people re-use content from within their organization inside new emails and documents. Users are only able to see and draw in content that they're authorized to view based on the privacy and security settings within their organization. QuickStarter is a feature for PowerPoint and Sway that gives users a curated outline for a topic they're working on based on information in Bing. 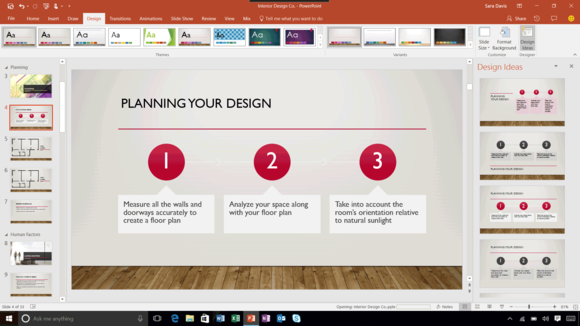 When users start a presentation, PowerPoint and Sway will ask them for a topic. After that, they'll be presented with a list of templates based on that topic, along with some starter slides that they can elect to include in their presentation. Slides will be populated with information from the Bing knowledge graph, and Creative Commons-licensed images from the web. It's available now for Sway on the web, and will be available in the PowerPoint Windows desktop app later this year. Speaking of PowerPoint, Microsoft is also updating PowerPoint Designer to help users lay out bulleted lists of text in more visually appealing ways. It's part of the company's ongoing push to make it easier for people to create visually appealing slides, without needing a professional degree in presentation creation. Microsoft Excel's new Map visualization makes it easier for people to see the geographic layout of information in a workbook. 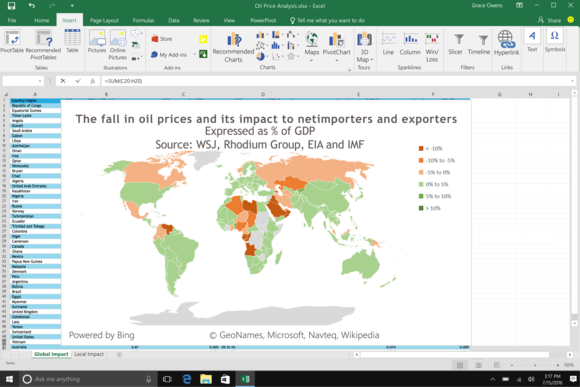 Excel users will also get a new Map visualization type on Windows desktop later this year. The feature will make it possible for people to lay out information geographically in a visualization that's powered by Bing Maps. Microsoft is also rebranding Delve Analytics as MyAnalytics, which lets users see how they compare to other people inside their organization in relation to how they spend time at work. In addition to the private analytics information that users can see already, Microsoft is also going to roll out new capabilities for leaders and members of teams to help them work better together.